Ryanair is wading into the Brexit debate by putting its marketing muscle behind a full-blown declaration of support for the 'remain' case. The airline is spending thousands of pounds on running ads in tomorrow’s newspapers that will state the case for a ‘yes’ vote in the 23 June referendum. It is also planning a number of ‘Vote Yes’-themed seat sales over the next four months and has created a ‘Vote Yes’ logo that will be emblazoned on a number of its planes. The politicking will not extend to passengers’ on-board experience, but the logo will go on emails to customers and the airline will use its website, which attracts around 1.2m people per month, and its social media channels to make the case. Ryanair's well-known public face, chief executive Michael O’Leary, is backing up the campaign with broadcast news interviews today. O'Leary will also appear in a video that will be released on Ryanair's own media channels over the next few days, according to chief marketing officer Kenny Jacobs. Jacobs said he wanted to "spend as little money as possible" on the campaign and that Ryanair was producing its material in-house. "There’s going to be videos, infographics and a bunch of other stuff that we’ll push out on social media," he told Marketing. "I think it’s a great campaign for social." "We’re putting the flag in the ground today, and editorial coverage of what Michael says today backed up by press ads tomorrow is a good way to launch it. We’ll probably run several other events like today in the run-up to the referendum." The press ad repeats a series of "Better for …" lines in support of the ‘yes’ case, including "Better for UK tourism" and "Better for UK holidaymakers". The airline is the first major brand to make its stance on Europe into a marketing concern, as opposed to a public pronouncement attributed to a chief executive. 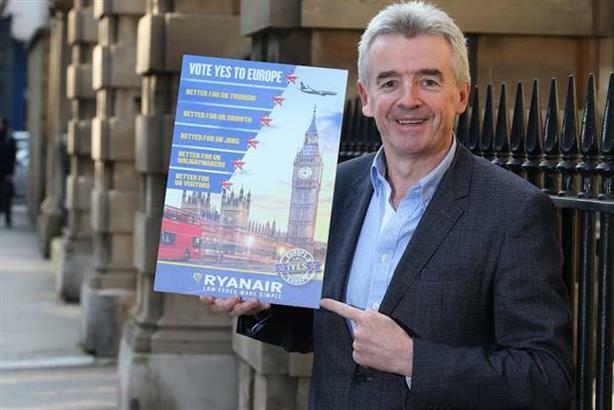 O'Leary did not argue that air fares would rise if the UK were to leave Europe, but he was keener to speak about the dangers that Brexit poses to the UK than to Ryanair. "Leaving Europe is not going to be the end of the world," he said at a press conference to announce the company’s latest growth plans and the campaign. "But the economy of the UK will be damaged for the next three or four years and foreign inward investment will certainly decline." Ryanair’s intervention may have the power to be more significant than at first it seems, as it helps the ‘Yes’ message get to British expats in Europe, who may vote to stay in out of fear of losing rights such as pension, healthcare and the right to own property in a renegotiation. British expats can vote in the referendum if they have lived outside Europe for fewer than 15 years. Co-op, John Lewis, Sainsbury's, Ryanair, RBS: who is the most trusted of them all?